Algorithms for scene understanding and realistic image synthesis require accurate models of the way real-world materials scatter light. This class describes recent work in the graphics community to measure the spatially- and directionally-varying reflectance and subsurface scattering of complex materials, and to develop efficient representations and analysis tools for these datasets. We describe the design of acquisition devices and capture strategies for BRDFs and BSSRDFs, efficient factored representations, and a case study of capturing the appearance of human faces. Jason Lawrence is an Assistant Professor in the Computer Science Department at the University of Virginia. He holds a Ph.D. in computer science from Princeton University. Jason's principal research interests focus on the acquisition and efficient representation of real-world material appearance. He recently introduced an "Inverse Shade Trees" framework for representing measured surface reflectance through a hierarchical decomposition designed for efficient rendering and editing. Hendrik P. A. Lensch is the head of an independent research group "General Appearance Acquisition and Computational Photography" at the MPI Informatik in Saarbruecken, Germany. The group is part of the Max Planck Center for Visual Computing and Communication (Saarbruecken / Stanford). He received his diploma in computers science from the University of Erlangen in 1999. He worked as a research associate at Hans-Peter Seidel's computer graphics group at the MPI Informatik in Saarbruecken and received his PhD from Saarland University in 2003. He spent two years (2005-2006) as a visiting assistant professor at Stanford University, USA. His research interests include 3D appearance acquisition, image-based and computational photography rendering. He has given several lectures and tutorials about this topic at various conferences including SIGGRAPH courses on realistic materials in 2002 and 2005. Szymon Rusinkiewicz is an associate professor of Computer Science at Princeton University. His work focuses on acquisition and analysis of the 3D shape and appearance of real-world objects, including the design of capture devices and data structures for efficient representation. He also investigates algorithms for processing complex datasets of shape and reflectance, including registration, matching, completion, symmetry analysis, and sampling. In addition to data acquisition, his research interests include real-time rendering and perceptually-guided depiction. He obtained his Ph.D. from Stanford University in 2001. Tim Weyrich is a Post-doctoral Teaching Fellow at Princeton University, working in the Computer Graphics Group Princeton. His research interests are appearance modeling, 3D reconstruction, cultural heritage acquisition, and point-based graphics. Prior to coming to Princeton in Fall 2006, he received his PhD from ETH Zurich, Switzerland, where he developed a novel face scanner to analyze human skin reflectance, allowing for photo-realistic reconstructions of human faces. He received his Diploma degree in computer science from the University of Karlsruhe (TU), Germany, in 2001. Todd Zickler received his Ph.D. in electrical engineering from Yale University in 2004 and is currently an assistant professor in the School of Engineering and Applied Sciences at Harvard University. 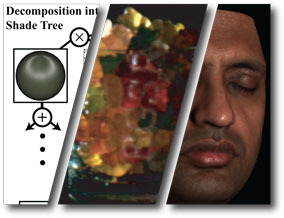 His research spans computer vision, computer graphics and image processing, and he is currently focused on developing representations of appearance and exploiting them for visual inference. In 2006, he was the recipient of a career award from the US NSF titled, "Foundations for Ubiquitous Image-based Appearance Capture."